The pass is a truly stunning stretch of road, climbing almost immediately left out of town at the T-junction. Over the many times we’d turned at that spot we’d often joked about a quick spin up the pass, and on more than one occasion I’d looked up in awe at it’s curves sweeping their way high up the mountain side. So I didn’t take much convincing to have a dabble and see if I could come up with a workable route for the upcoming DC training ride on Sunday..
A couple of days later, after some tinkering with Garmin Connect course mapping, I was feeling rather pleased with myself at the route I’d sketched out. 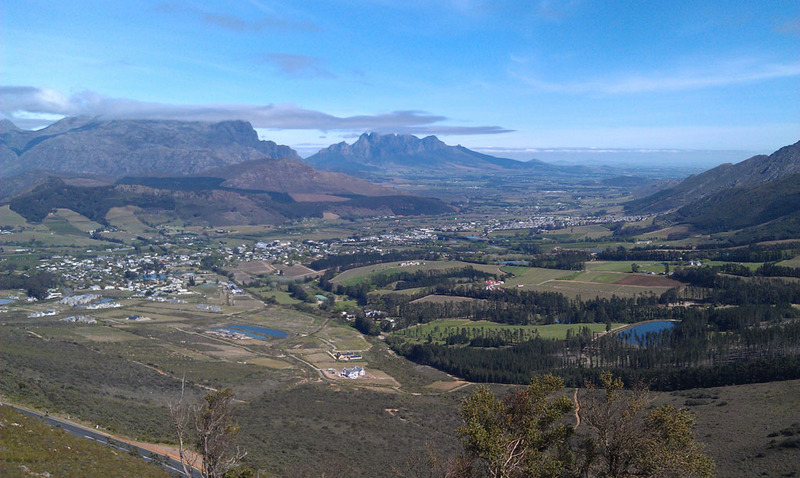 Not only did it meet the two main requisites of distance and including Franschhoek pass, but I felt I’d managed to embody some of the feel of the DC – with increasingly steep hills over first half of the ride, and a succession of rolling hills on the way home. With the pass top at almost bang on half way, and pit-stop opportunities after the free-wheel down, I was pretty confident we’d be in for a good ride. Clearly my powers of persuasion weren’t at their strongest at 6am on a blustery Sunday morning however, as I completely failed to communicate my enthusiasm for the route to the gathered group of DC riders. The majority opted for a straight ride to Franschhoek, and without discussion had spun around and were already disappearing along the car park entry road. Seven of us were left: myself, Des, Desiree, Penny, Theunis, Tom, and Wiehahn. After a quick check that we were all up for the challenge we headed out along Old Main Road. The threat of rain was holding off, but we were battling head-on into a chilly northwester over the opening kilometres. The mood was good though, regularly swapping turns working at the front, spirits buoyed by a glorious sunrise over the Helderberg mountains to our left, lighting up a brilliant green patchwork of vineyards and farmland. The day got sunnier as we rode on up the first short climb of Vlaberg, and the longer climb of Helshoogte, but it didn’t get much warmer. 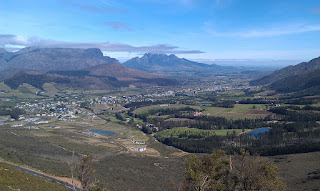 I’d lost most of my cycling warmth after a puncture stop, prolonged by a defective new inner tube that immediately split at the valve, and as we started out again on the final stretch into Franschhoek I was feeling chilly again. Luckily though the right knee injury which flared up after Wednesday’s ride seemed to have settled down, and I mentally thanked Andri for his careful gym program the previous Friday which seemed to have worked it’s magic. At some point soon after the puncture we passed the original Wannabee group heading back for home: I wondered if they had also done the pass, since surely they would have been further on by then otherwise. After three or four more changes of turn at the front, our group reach the monument and the T-junction, and swinging left we headed into completely unknown territory for me. A brief stop was needed for jackets to be removed and stowed ahead of what was likely to be a sweaty climb. As we stood and chatted it was impossible not to look up at the snaking road, and from below it seemed long and steep. Not really knowing what to expect, I was all too glad to hold back and wait for Theunis to sort his gear out. As he, Desiree and I started out, the rest of the guys were already quite some way ahead and were pulling hard across the first ramp past Haute Cabriere and Le Petite Ferme. Realising the scale of the climb ahead, the three of us settled into an nice steady pace. Theunis seemed to be feeling the pressure a tad, and as we reached the first hairpin he slowed and said he’d got as far as he could and would wait for us at the BP station at the bottom, previously agreed as our rendezvous point before the return home. 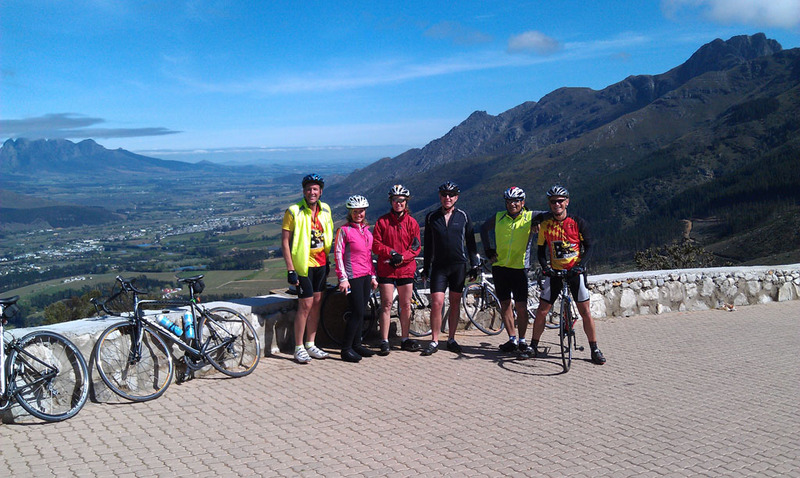 Desiree and pushed on, and were rewarded soon after as the pass rose out of the trees revealing a stunning view across Franschhoek and the entire sweep of winelands beyond. The day was bright and clear and the scenery more breathtaking than I ever remembered having seen it from a car.We were even accompanied briefly by an Orange Breasted Sunbird, flitting between protea heads alongside the road. Just ahead of us we saw a luminous green jacket that Desiree commented might be Tom. It soon became clear we were gradually gaining on the rider though, meaning there was no way it could be, and sure enough over the next kilometre or so we pulled alongside Des working his way up the pass. Remembering Paul’s kind gesture two weeks back, I called Des to latch on and our group was once more three riders. I’d expected a final steep rise after the last tight hairpin, a turn of considerably more than 180 degrees. But both my memory of the road, and it’s appearance from beneath were deceiving, and as we exited the turn the road levelled out and we each shifted up a gear or two and raced up to join our fellow riders at the viewpoint stop. It seemed I wasn’t the only one to have been blown away by the fabulous climb, as Penny and a number of the other guys commented what an awesome ride up they’d had and how tremendous the view was. All too soon we had to turn back down the pass and our refuelling stop before the rolling hills home. Before leaving though we managed to lasso a honeymoon couple to snap a team photo to mark the occasion. The ride down the pass was one long, fast, icy blast – the cold wind seeming to find us again despite the clear sunny skies. And after a quick fill up of water bottles and tummies, we tackled the remaining 60km or so home. The route plan proved rather too good, and the rollers started to hurt along the road from Simondium to Klapmuts. The psychological effect of turning left onto the R44 for home though seemed to work wonders, and my spirits and energy levels lifted almost immediately. It seemed to have a similar effect on others too: Des’ cramps started to lift shortly after the Wiesenhof climb, and Theunis was resolutely stuck on our wheels despite a reasonably quick pace over the remaining few kilometres. Even my slight miscalculation didn’t seem to dent spirits as our various Garmins and cycle computers all came up a shade short of the targeted 140km as we rolled back into the car park. A memorable ride, great company, and a truly outstanding pass on a glorious Cape spring day. Training rides don’t come much better.